A Gold color metal and enamel device 1 1/4 inches (3.18 cm) in height consisting of a shield blazoned: Sable, a Maltese cross Argent. Attached below and to the sides of the shield is a Gold scroll inscribed "HONOR ET FIDELITAS" in Black letters. This was originally the Puerto Rico Regiment, name changed to 65th Infantry in 1920. Puerto Rico was discovered in 1493 by Columbus, and named by him "San Juan" which is still retained by the largest city, where the 65th Infantry has been stationed. The name "San Juan" was for the old military order of St. John of Jerusalem, later known as the Knights of Malta, whose habit was black with a white Maltese cross, which has accordingly been adopted for the shield of this Regiment. The motto translates to "Honor and Fidelity." The distinctive unit insignia was originally approved for the 65th Infantry Regiment on 27 November 1923. It was amended to change the allotment to the Puerto Rico Army National Guard and add the motto on 13 June 1968. Sable, a Maltese cross Argent. CrestThat for the regiments and separate battalions of the Puerto Rico Army National Guard: On a wreath of the colors Argent and Sable upon a closed book Gules with pages edged Or a paschal lamb couchant with staff and banner of San Juan (Gules a cross Argent) all Proper. 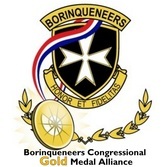 This was originally the Puerto Rico Regiment, name changed to 65th Infantry in 1920. Puerto Rico was discovered in 1493 by Columbus, and named by him "San Juan" which is still retained by the largest city, where the 65th Infantry has been stationed. The name "San Juan" was for the old military order of St. John of Jerusalem, later known as the Knights of Malta, whose habit was black with a white Maltese cross, which has accordingly been adopted for the shield of this Regiment. The crest is that of the Puerto Rico Army National Guard. The coat of arms was originally approved for the 65th Infantry Regiment on 9 February 1921. It was amended to delete the crest originally approved for the organization and add the Puerto Rico Army National Guard crest on 14 August 1961.